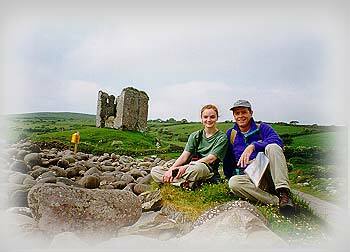 Wally Trimble and his daughter Kate pictured on the right, with Minard Castle in the background, walked the DingleWay in May 1998. As we rounded the corner on a small country road, we saw an elderly Irish farmer headed toward us on his way to check his flock of sheep. He looked us up an down and quickly surmised that we were a couple of walkers, out to enjoy the day. He touched the brim of his woolen cap and nodded slightly. “‘Tis a fine mahrnin ye have for it,” he said. We agreed that it was and continued along the lane, skirting hedges of blooming fuchsia and wondering at the simple beauty of the landscape. The Dingle Peninsula in southwest Ireland provides a variety of settings for the walker, ranging from country roads, like this one, to beaches, cliffsides and mountains. My daughter, Kate, and I were on the first day of hiking part of the Dingle Way, a 112-mile circular route around the Peninsula. It begins and ends in Tralee, going through Camp, Annascaul, Dingle Town, Ventry, Slea Head, Feonaugh, Cloghane and Castlegregory. We had decided to begin in Camp and walk around to Castlegregory, doing about 12 miles per day for six days. Our trip had been prearranged so that we were booked into a bed and breakfast each night, were provided with a packed lunch and a supper, and our packs were transported from one destination to the next. It was my first experience with this sort of walking, and I found being unburdened of a 40-pound backpack very liberating. I carried a light rucksack with rain gear (necessary), water and food. Kate just walked. The trip, in late May and early June of 1998, was a celebration of Kate’s graduation from college. It also became a great way for a father and daughter to get to know one another better as companions on an adventure. After a good meal and Irish music the night before at Ashe’s Pub in Camp, we set out from Finglas House with a lunch packed by Kathleen Daly and headed up the road toward Annascaul. This is a day of walking across the peninsula on secondary roads, with little or no traffic, and on farm roads. It’s also a day of beautiful views of Catherconree Mountain on the left, and Tralee Bay behind. The view opens up to the south on the way over the middle of the peninsula on roadways lined by hedgerows of fuschia. The walk continues through peat bogs where “logs” have been cut and left to dry before being taken for fuel. Then Inch Strand appears, a three-mile-long spit of beach that separates Castlemaine Harbor from Dingle Bay. A bit later, the view behind is of Carrauntouhill, Ireland’s highest peak. The road then leads down into Annascaul, with a view of Annascaul Glen and Annascaul Lake off to the right. Our night’s stay in Annascaul was at the Anchor Townhouse. Next door is Dan Foley’s famous pub, where a peat fire and glass of Guinness were waiting. We had been walking with beautiful views of a mountain ridge between us and the northern side of the peninsula when we crested a hill and Kate saw her first castle. This was a small one, and a ruined one at that, but it made an exciting discovery nonetheless. She pointed and we stood a quarter-mile away from it, admiring the scene: Minard Castle, built in the 15th century and destroyed by Cromwell in 1650. Its corners still show where explosions tore them open as Cromwellian forces attacked. Walter Hussey, a leading Anglo-Norman who had fled there seeking safety after an earlier attack at Castlegregory, was killed, as were all the forces garrisoned there. Today, with the cold, blue water stretching to the horizon and the impressive cliffs, it’s a peaceful spot. We had our picnic lunch there before continuing on toward Dingle Town. Much of the walk after Minard is on secondary roads through farm country. The approach to Dingle, however, takes a detour over the shoulder of Sugarloaf Mountain through rocky fields. Then a long gravel road and down into Dingle Town, with a nice view of Dingle Bay. Our night in Dingle was passed at The Captain’s House, a lovely B&B filled with antiques, where breakfast is served in a glass-enclosed porch with a view of the gardens. Dingle is the place on the peninsula to do some shopping, find a good restaurant and stock up on money at a bank machine. The walk to Slea Head is the toughest, and most rewarding, of the Dingle Way. It begins by rounding Dingle Bay, then joins an ancient road, now a grassy path, that climbs gradually with beautiful views of the bay behind and the coast beyond. As it heads downhill toward the beach at Ventry, Rathinnane Castle’s ruins can be seen a mile or so to the right. Then a two-mile walk along the beach at Ventry before heading up a green road called Bothar Dorcha (Dark Road) that heads over the shoulder toward Slea Head. On this stretch is one of the best concentrations of archaeological sites on Ireland. It includes Iron Age promontory forts, such as the one at Dunbeg, and scores of beehive huts (clochain), which are small circular enclosures, most of which date to early Christian times. To walk here, along ancient stone walls, fording streams coming off the mountain, is to be transported into the distant past. Rounding the mountain toward Slea Head presents a breathtaking view of the Blasket Islands, now deserted but with their heritage of a generation of great Irish writers. Here, in Blasket Sound, the Santa Maria de la Rosa of the Spanish Armada sank in 1588, yielding a single survivor. Our night was spent at Slea Head Farm, where our room afforded a view of the Blaskets. This was a rainy day filled with mishaps and happy endings. We left Slea Head Farm in a drizzle that turned to a downpour by the time we reached Dunquin. There, crossing a stream along the coast, I perched on a slippery rock and took a step to the next, lost my footing and fell heavily on my side, bruising my leg and shoulder. Kate made a more cautious crossing, jumping into a bed of kelp and sinking up to her hips in the muck. We nursed my bruises and washed out Kate’s boots and socks, which were reduced to a slimy, foul-smelling mess. The expected views of Mount Brandon to the right, and the cliffs and sea to the left, were lost in rain and mist. We were discouraged and so took a detour into Ballyferriter. There, we found a warm pub where we had a good, hot lunch and some ale. The sun greeted us as we emerged an hour later, and accompanied us as we walked the beach toward Murreagh, then along the cliffs toward our destination of Gorman’s bed and breakfast at Baile na nGall. There, hosts Sile and Vincent Ui Ghormain treated us to a good meal and provided us with comfortable beds for the night. The walk over the shoulder of Mount Brandon on this day was a highlight of our trip. It begins with a gradual climb of about 2,000 feet in elevation to the shoulder, with wonderful views behind of Three Sisters, the small peaks along the coast that were Charles Lindbergh’s first sight of land on his trans-Atlantic flight. At the shoulder of Brandon is a view of the coast toward Tralee, marked at the highest point by a 3,500-year-old Druid standing stone with Ogham writing still visible on its weathered surface. Then a steep, muddy descent into a bog with more beehive huts on the slope and a walk on a gravel road down toward Cloghane. Our stay at Cloghane was at O’Connor’s Guesthouse, with its small, comfortable pub and a great breakfast in the morning, courtesy of hosts Sherry and Michael O’Dowd. This is an unremarkable day’s walk on beaches, made interesting by the remains of a 15-century church and graveyard at Stradbelly. 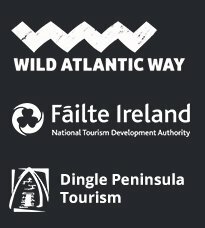 Farther along is the Lough Gill wildlife sanctuary and more beach walking around a peninsula before coming to Castlegregory. There, we celebrated our walk’s end in a couple of pubs before retiring for the night at Aisling, a bed a breakfast owned by Helen Healy.